You’re a smart shopper. That explains why there’s always a legion of reanimated undead corpses lining up for a taste of your delicious brains. Our good friends at Zombie Defense Solutions haven’t yet found a way to cure those poor souls, rotting away as they shamble down the bloodstained streets. But they have compiled a survival kit containing everything that you’ll need to avoid an unpleasant death. 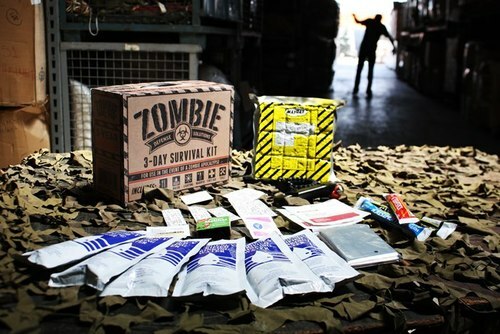 The Zombie Defense Solutions: 3-Day Survival Kit contains: FOOD: 3600 Cal. Energy Bar – Provides 3 days worth of food. Energy bar is scored into nine-400 calorie portions. Packaged to insure consistent nutritional values and has a storage life of 5-7 years. WATER: Purified Drinking Water – 6 long lasting, triple layered retort pouches that hold 4.227 fl oz of water. Stores for a min of 5 years. LIGHTING: Matches & Lightsticks – 1 box of waterproof matches, (3) 6″ lightsticks with lanyard hole and hook. Creates instant lighting lasting 12 hours each. WARMTH: MYLAR Emergency Blanket – Waterproof, reflective surface for high visibility. Space age design retains up to 90% of body heat for cooling in hot climates. Compact, yet opens to 84″ x 52″. FIRST AID: Basic First Aid Kit – A small assortment of fresh, sterile products that includes: (7) Adhesive bandages, (2) gauze pads, (2) Alcohol Prep Pads, (2) Wet Naps, (1) Triple Antibiotic Ointment TOOLS: Emergency Hammer & Survival Bracelet – (1) Emergency Hammer – Shatters glass and has a built-in seat belt cutting tool, (1) Survival bracelet with Built-In Emergency whistle – made of nylon cord that can be unwound to 10 feet in survival situations.